Case Study explaining how Queen’s Park CE/URC Primary School have developed their Primary French provision to receive the PLDA Outstanding Award. Watch how Queen’s Park CE/URC Primary School have developed “Outstanding” MFL provision. Queens Park CE URC Primary School in St Helens in the North West of England have developed an outstanding programme of primary languages (French) in their school across KS1 and KS2. All the children have weekly French language learning lessons. SLT and governors see language learning as an integral part of the whole school development and therefore there is a clear vision for the development and progress of sustainable and successful PFL in school. All teachers and teaching assistants are fully engaged and committed to language learning in their own classes and across the school and wider community. The school and wider school community are now engaged in the learning and there is an ever-growing ‘Erasmus Plus’ project with schools across the World. In 2017 the school achieved the PLN Primary Languages Development Award at “outstanding” level being able to demonstrate how the school, its vision, the support of SLT, the delivery of weekly effective learning and the commitment of the whole staff helps this school give all its pupils an excellent start in the learning of a foreign language. 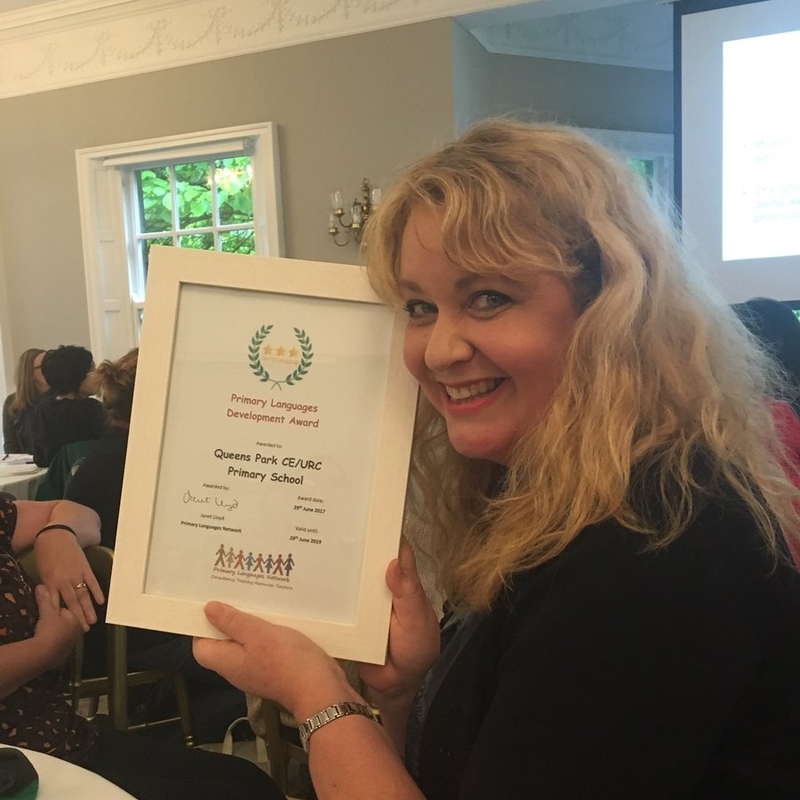 Meet Carol Taylor, the MFL coordinator, (@caroltaylor722) who has led the development and success of the primary foreign language learning programme in Queen Park CE URC. Queen’s Park CE became Premium Members of Primary Languages Network in 2013. French was already a timetabled subject in the school curriculum, delivered weekly by Carol, a primary teacher with a degree in French. The staff were already becoming more engaged with primary languages and SLT and Carol wanted to find ways to engage staff more and to boost confidence in language skills that staff may already possess. With PLN Carol was able to access coordinator CPD and 1 to 1 consultancy and training time as the MFL coordinator. Primary Languages Network membership entitled Carol to whole staff CPD; first in simple pedagogical and class teaching approaches; then in whole staff CPD with a French native speaker trainer from PLN and then finally to look at language learning skills and progress that young children make with effective primary languages teaching and learning. Carol now finds as many opportunities as possible to deliver short French CPD episodes and encourage the staff to develop and build their French primary language teaching knowledge. Staff are encouraged to attend the annual Primary Languages Network conference alongside Carol and to participate and share in local networking opportunities. Over the last six years, under Carol’s dynamic subject leadership,the school has developed an exciting and engaging programme of learning for the whole school from EYFS to Year 6. Whole school engagement with the French language learning programme. The school now uses the PLN Ready Made French SOW in KS2 and the KS1 French programme on the PLN VLE. Staff celebrate lessons and share and promote outcomes and progress on their twitter feeds. Carol leads the French teaching and learning of French across the school. Using the Ready Made SOW for French, including the “PLN French wellness pack” all the staff can confidently include teaching 5 or 10 minutes of French in their own weekly class teaching. Staff reinforce the language learning that takes place with Carol in direct teaching time and the teachers now look for ways to reinforce this language learning in other areas of the curriculum. The school identified the need to introduce native speaker language learning in to their French language learning curriculum and ran a series of very successful PLN Yoga Super Days for the KS2 children. The school now celebrates their language learning with the wider school community, engages parents with the learning and works closely with its local main feeder high school. Membership of Primary Languages Network has helped Carol and the school to network and share with 300 plus primary schools who deliver primary language learning in their own settings and to share and draw inspiration from each other. At Coordinators’ CPD as part of Primary Languages Network, Carol began to investigate possible links with a French school. and at the annual PLN conference in 2017, Carol investigated the opportunity of Erasmus Plus funded French language training in Rouen for the whole staff. In early Summer 2018, Carol led two very successfulmweeks of whole staff French and culture CPD in Rouen. This inspired the staff and further developed their confidence in their own ability to lead French language learning back in school. Queens Park have come such a long way in the five years Primary Languages Network have worked with them. The school has a dynamic and thriving link with a French partner school and the whole school have used their experiences in Rouen, Northern France to enhance the whole school curriculum in Art ,History, PHSE, Literacy to name a few subject areas. The school is now reaching out to the wider global community and making links with schools across the World. Sharing and networking - conference presentation time. As members of the Primary Languages Network, schools are encouraged to share their effective practise. This year at the annual conference in 2018, it was PLN’s pleasure to invite Carol Taylor and her colleague Andrea Atherton (Year 5 teacher and Art Coordinator) to deliver a presentation on how the school has grown in their understanding of primary foreign languages and how it has become an integral part of the whole school curriculum. Would you like Primary Languages Network to transform the teaching and learning of primary languages in your school?